"Promoting Economic Development in the Dive Community"
It is my very great pleasure to announce that Ms. Michele Felberg, age 23, from Houston, Texas was selected on March 2nd to be the 2015 North American Rolex Scholar of the Our World-Underwater Scholarship Society. Michele earned a Bachelor of Science degree in Environmental Studies, with a minor in Economics, from the University of Southern California. She is a NAUI Divemaster and AAUS Scientific Diver. 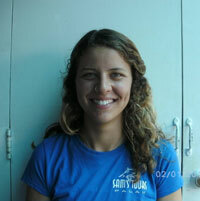 She is currently living in Palau, where she is a Dive Guide and Underwater Naturalist. Her primary underwater interests are research, conservation, and finding innovative ways to encourage people to cherish and protect the ocean. Please see the attached bio and photo to learn more about Michele. The Scholarship Selection Committee feels that Michele is highly qualified to excel in her role representing the Scholarship Society and has the determination and passion to make a lasting contribution to the underwater world in the future. I am sure you will all wish to join me in welcoming Michele to the Scholarship family and wish her success in her upcoming year of challenge, adventure, and learning. She can be reached at felberg@usc.edu. Michele Felberg Bio: Michele Felberg, from Houston, Texas, always had an affinity for water but didn’t quite grasp her love for the underwater world until her years earning a Bachelor of Science in Environmental Studies and a minor in Economics at the University of Southern California. It was during her sophomore year that she realized the magnitude of her passion and curiosity through her participation in two new Environmental Studies courses. First, in the Intro to Scientific Diving course she earned her NAUI Open Water certification as well as the AAUS scientific diver certification. In the second course, Integrated Ecosystem Management in Micronesia, she intensively studied the marine ecology, biodiversity, and conservation management of Micronesia and then traveled to Guam and Palau for a field research trip to evaluate coral reef health. Data collected in this research were used, in part, as justification for listing Palau’s Southern Lagoon as a World Heritage Site. This experience opened Michele’s eyes to the beauty and complexity of the marine world and she decided to pursue a concentration within the Environmental Studies department called “Oceans, Life, and People” which focused her studies on the underwater world. She spent half of her junior year in New Zealand, where she studied marine science, conducted research on freshwater macroinvertebrate populations and stream health, and sparked her love of adventure traveling. As a senior she worked as a research assistant on a seagrass-monitoring project in Big Fisherman’s Cove on Catalina Island, examining monthly fluctuations in seafloor coverage of a foundation species of seagrass, Zostera marina. Michele presented the results of this research at the annual Southern California Academy of Sciences symposium. Supplementing her research diving, she earned her Rescue Diver and Training Assistant certifications during the fall of her senior year. The few weekends of her senior year Michele didn’t spend diving on Catalina Island, she was heavily involved in an organization called SC Outfitters, leading students on hiking and camping trips around the Southwest US, sharing her passion for the great outdoors and exploration. During her last semester at USC, Michele was asked to serve as a Teaching Assistant (TA) for the two environmental studies courses that initiated her interest in the underwater world. This position is rarely offered to an undergraduate. While assisting in the teaching of academic content and class logistics, Michele helped with the dive training of the new students and earned her Divemaster certification. Immediately upon graduation, she returned to Micronesia as a TA for the USC summer research field course in Palau. At the end of the class she was offered a position as a Dive Guide/ Underwater Naturalist at one of the top dive centers in Palau. Her work in Palau has fed her love for experiencing new cultures, diving, and sharing the wonders of the underwater world with the guests she guides. She has opportunities to assist visiting researchers with their projects and was instrumental in developing a lecture series to inform guests, from a scientific perspective, about the local fauna, flora, and reef ecology. In addition, living in Palau has given her a greater appreciation for the power of local communities tied to the oceans and a better understanding of the importance of incorporating local knowledge with scientific research. On the few days a month she doesn’t dive, Michele enjoys reading a good book, going on runs, exploring the land attractions of Palau, and wishing she was diving. One of Michele’s long-range goals is to provide a legacy of relentless pursuit of the conservation and protection of the oceans by fostering within others a mindset that every individual can make a positive impact on marine conservation. This entry was posted in Our World-Underwater Scholarship Society, Scholarships and tagged Dive Undustry Association Member, Non-Profit, Our World, scholarship. Bookmark the permalink.